Astronomers using the National Science Foundation's Very Long Baseline Array (VLBA) have directly measured the distance to a star-forming region on the opposite side of our Milky Way Galaxy from the Sun. Their achievement nearly doubles the previous record for distance measurement within our Galaxy. "This means that, using the VLBA, we now can accurately map the whole extent of our Galaxy," said Alberto Sanna, of the Max-Planck Institute for Radio Astronomy (MPIfR) in Germany. Distance measurements are crucial for understanding the structure of the Milky Way. Most of our Galaxy's material, consisting principally of stars, gas, and dust, lies within a flattened disk, in which our Solar System is embedded. Because we can't see our Galaxy face-on, its structure, including the shape of its spiral arms, can only be mapped by measuring distances to objects elsewhere in the Galaxy. The astronomers used a technique called trigonometric parallax, first used in 1838 to measure the distance to a star. This technique measures the apparent shift in the sky position of a celestial object as seen from opposite sides of the Earth's orbit around the Sun. This effect can be demonstrated by holding a finger in front of one's nose and alternately closing each eye—the finger appears to jump from side to side. Measuring the angle of an object's apparent shift in position this way allows astronomers to use simple trigonometry to directly calculate the distance to that object. The smaller the angle, the greater the distance. 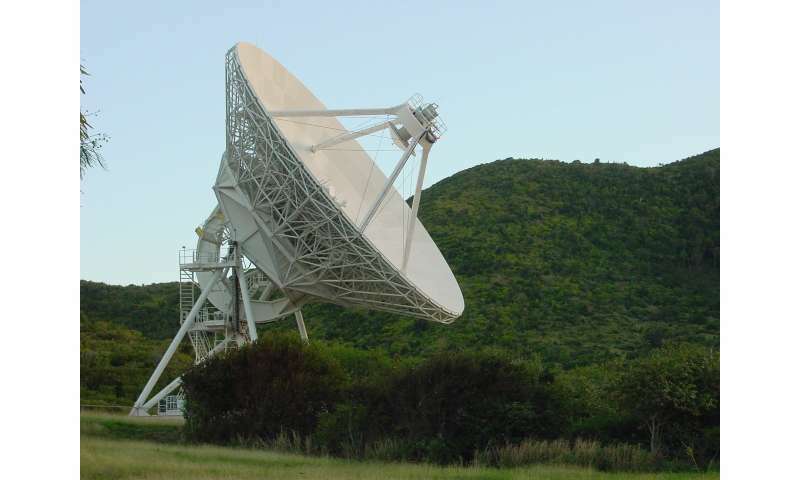 The VLBA, a continent-wide radio telescope system with ten dish antennas distributed across North America, Hawaii, and the Caribbean, can measure the minuscule angles associated with great distances. In this case, the measurement was roughly equal to the angular size of a baseball on the Moon. The new VLBA observations, made in 2014 and 2015, measured a distance of more than 66,000 light-years to a star-forming region called G007.47+00.05 on the opposite side of the Milky Way from the Sun, well past the Galaxy's center, some 27,000 light-years distant. The previous record for a parallax measurement was about 36,000 light-years. "Most of the stars and gas in our Galaxy are within this newly-measured distance from the Sun. With the VLBA, we now have the capability to measure enough distances to accurately trace the Galaxy's spiral arms and learn their true shapes," Sanna said. The VLBA observations measured the distance to a region where new stars are being formed. Such regions include areas where molecules of water and methanol act as natural amplifiers of radio signals—masers, the radio-wave equivalent of lasers for light waves. This effect makes the radio signals bright and readily observable with radio telescopes. "The Milky Way has hundreds of such star-forming regions that include masers, so we have plenty of 'mileposts' to use for our mapping project, but this one is special. We're looking all the way through the Milky Way, past its center, way out into the other side," said the MPIfR's Karl Menten. "Within the next 10 years, we should have a fairly complete picture," Mark Reid of the Harvard-Smithsonian Center for Astrophysics (CFA) predicted.